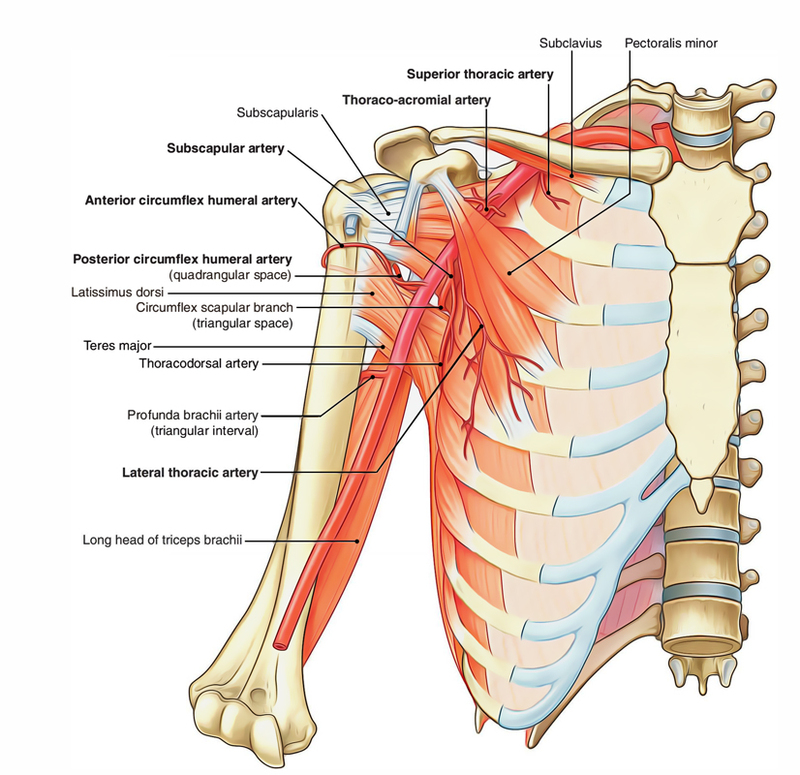 The Axillary Artery is the main artery of the upper limb. It begins at the outer border of the first rib as the continuation of subclavian artery and ends by becoming brachial artery at the lower border of teres major. In axilla, it runs from apex to the base along the lateral wall nearer to the anterior wall in relation to the posterior wall. During it’s course via axilla, it is crossed on it’s superficial aspect by the pectoralis minor muscle, which divides it into 3 parts. The axillary vein is medial to the artery and the cords of brachial plexus are arranged around the 2nd part of the artery (i.e. part deep to the pectoralis minor); the lateral cord being lateral, the medial cord medial, and posterior cord behind. First part, superior (or proximal) to the muscle. Second part, posterior (or deep) to the muscle. Third part, inferior (or distal) to the muscle. The axillary vein is located medial to the axillary artery throughout it’s course, but the relationship of cords of brachial plexus and their branches are different for every of the 3 parts of the artery. 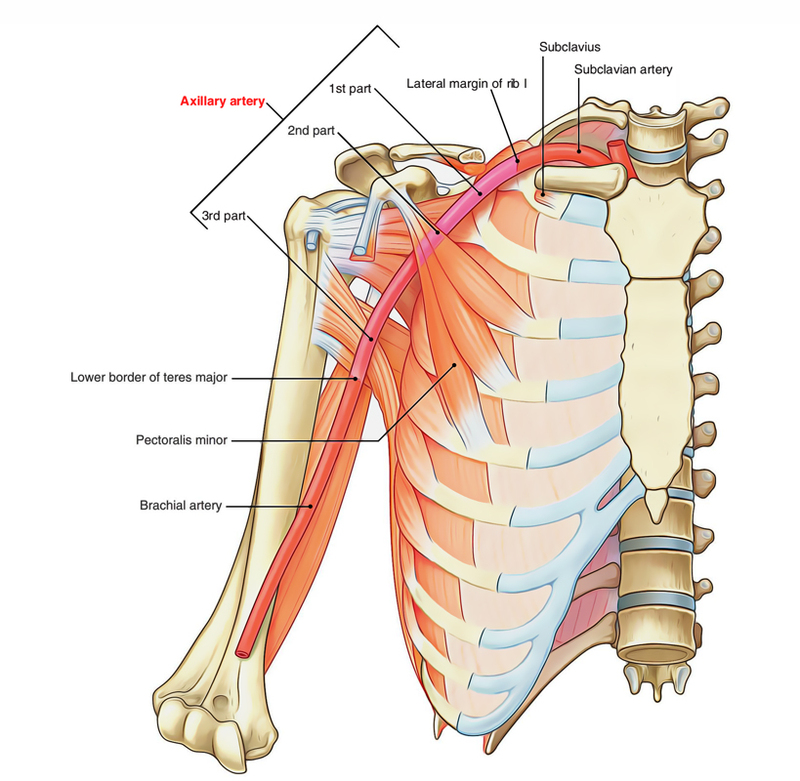 The relations of the 3 parts of the axillary artery are given in the Table Below. First part 1.Pectoralis major (clavicular part). 2.Loop of communication between lateral and medial pectoral nerves. 1.Medial cord of brachial plexus. Second part Pectoralis minor 1.Posterior cord of brachial plexus. Third part Medial root of median nerve 1.Radial nerve. 3.Subscapularis (in the upper part). 4.Teres major (in the lower part) 1.Axillary vein. 2.Medial cutaneous nerve of forearm. The axillary artery comprises of 6 branches: 1 branch from first part, 2 branches from the next part, and 3 branches from the third part. Majority of these branches go towards the walls of the axilla. Superior thoracic artery, a very small branch, originates near the subclavius, enters between the pectoralis major and minor muscles, and then these muscles go towards the medial wall of the axilla. These branches radiate at right angle to every other. The pectoral branch consists of pectoral muscles, deltoid branch, ends by joining anastomosis over the acromion, clavicular branch supplied sternoclavicular joint. Lateral thoracic artery : emerges at and runs along the inferior border of pectoralis minor, supplying the branches to pectoralis major and minor and serratus anterior muscles. In the females, the lateral thoracic artery is large and gives significant supply to the breast via it’s lateral mammary branches. Subscapular artery, the largest branch of axillary artery, runs along the lower border of the subscapularis and ends near the inferior angle of the scapula. It supplies a large branch, the circumflex scapular artery; which goes through upper triangular intermuscular space, winds round the lateral border of scapula to goes into infraspinous fossa. Additionally, it supplies numerous small branches. Anterior circumflex humeral artery, a small branch, enters in front of surgical neck of humerus and anastomoses with the posterior circumflex humeral artery to create an arterial circle around the surgical neck of humerus. It supplies an ascending branch, which runs upwards into the intertubercular sulcus of humerus to supply the head of humerus and shoulder joint. Posterior circumflex humeral artery, larger in relation to the anterior circumflex humeral artery, enters backwards, together with axillary nerve via the quadrangular intermuscular space, crosses the posterior aspect of surgical neck of humerus to anastomose with the anterior circumflex humeral artery. It supplies the deltoid muscle and shoulder joint.